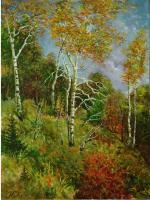 "Painting of nature contains roots of our culture, our love of environment and above all our love of Humanity". 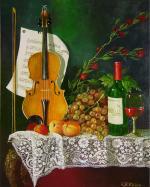 His special style and artistic technique are based on richness and diversity of nature. He seeks harmony and nature despite all cataclysmic events that happen in the world and establishes it in his works. Mark Kalpin's favorite seasons are fall and winter. 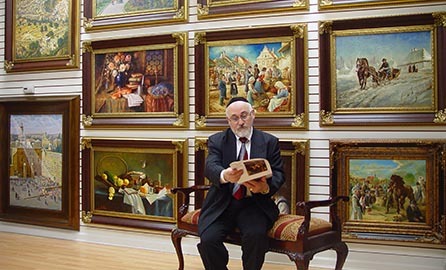 He is able to catch all varieties of colors so as a spectator has a feeling that the painting is alive and breathing. Mark Kalpin was born in 1926. in Ukraine. How many Mark of remembers, always he adored to draw. Paints of world around lived in its soul he transferred them on sheets of a paper. But unfortunately Mark's youth fell on the World War II, and he was serving as a military pilot during the War. But the dream to become the professional artist did not leave Mark, and after the war he had graduated the Tartu Academy of Fine Arts and devoted himself to painting of landscapes and still-lifes. As Mark Kalpin says: "Painting of nature contains roots of our culture, our love of environment and above all our love of Humanity". 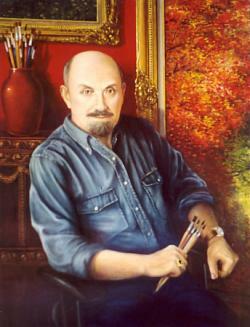 His special style and artistic technique are based on richness and diversity of nature. He seeks harmony and nature despite all cataclysmic events that happen in the world and establishes it in his works. Mark Kalpin's favorite seasons are fall and winter. He is able to catch all varieties of colors so as a spectator has a feeling that the painting is alive and breathing. Each landscape reflects deep romanticism. Really Mark Kalpin has a sharp sight of the artist, he always tries to find in surrounding landscapes on what the human soul may respond. Mark Kalpin was the recipient of many awards granted by-prestigious fine art institutions. Through the span of more than thirty years of his creative work he has been exhibited widely allover the world. Mark Kalpin's creativity is marked highly. His name is brought in the world art encyclopedia. 1994-1999- Art Gallery "Creative Alternative"